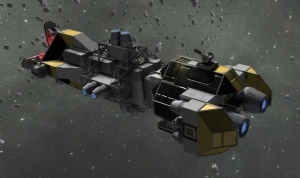 Relatively unarmed mining transport cargo ship with 4 large cargo containers, typically carrying unprocessed ore. The specific antenna that spawns drones has a range of 200 meters and is named: "EMERGENCY - REQUESTING ASSISTANCE". This antenna within range will spawn a Assailant drone in defense, at 3000 meters away from the player and every 5 minutes up to a total number of 3 drones active any time. Approach this ship from below, away from the single Gatling turret. No attack is necessary; the ship's defences can be disabled without being exposed to them. The ship has a single door, with the cockpit behind it at the rear of the ship (in between the 2 large thrusters). The small cargo container and each of the 4 large cargo containers and the can easily be raided. You can access the cargo throught the gatling turret above, or throught the small cargo container below the cockpit. All is connected together. Better do not access the large cargo containers directly. The ship would fall apart because the only connecting areas on a container are it's doors. There are 2 small reactors underneath the back hull. As of v.1.030 (list), the new Mining Carriage is a little bit longer than it's former version and has lost it's lower landing gear. The small reactors have moved from the side of the hull to the bottom of it. The gyroscopes are now located where the reactors were. There is now a collector on the front topside of the ship and a connector between the 4 remaining landing gears at the front end. This page was last modified on 25 April 2016, at 12:36.